Scarecrows can be scary and harmless at the same time. Farmer Dan is about to discover some scarecrows are about to become dangerous. 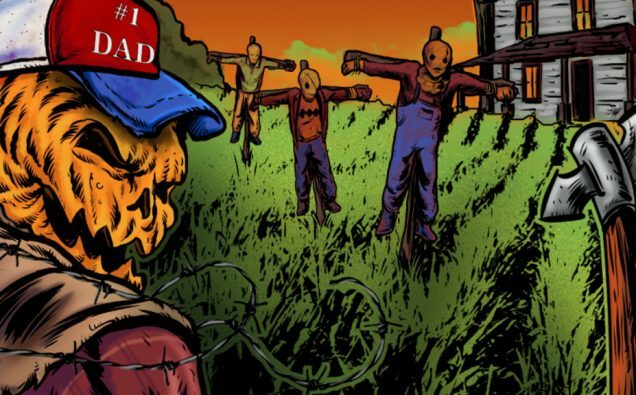 In the upcoming comic, Night of the Living Dad, one farmer must take a stand against four evil scarecrows. These scarecrows have been possessed by the souls of four angry fathers. And some teens are just now being targeted by these straw-filled demons. You can help make this tale a reality. A Kick Starter is up to show how you can help. You can also see a sneak preview of the upcoming comic. One the perks gives you a chance to appear in the comic. I think this story line is a great addition to both Horror and Comedy. Laugh all you want, just make sure the scarecrow behind you isn’t about to attack you. Here’s a quick preview to entice you.